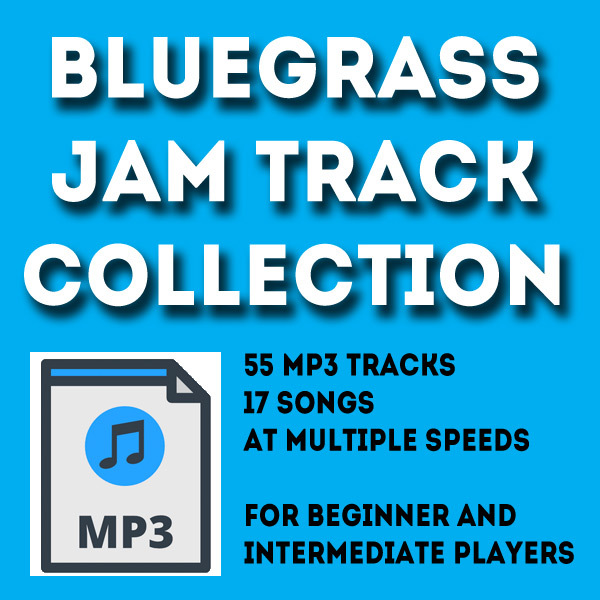 This is a set of 55 MP3 audio tracks designed for beginning and intermediate players. Set consists of 17 songs at multiple speeds. The download also includes a 12 page PDF booklet with the chord progressions written out. The total playing time is 2 hours and 8 minutes. Each song repeats multiple times and the average track is around 2.5 minutes. When you are learning to play it is often difficult to find really good musicians to play with you at the slow to moderate speeds you need. This collection solves that problem. And the entire collection costs less than one private lesson from a teacher! These tracks can be used to practice playing chords or solos with a first class bluegrass groove. The tracks were recorded by professionals and include guitar, mandolin and bass. The use of these tracks can improve the playing of any banjo, guitar, mandolin, fiddle, dobro or bass player. Load these tracks onto your favorite device (iTunes or any MP3 player) and start making some real progress in improving your accuracy, timing, and speed.